Those fabulous Giffords and their great pictures! You’ve had a good long wait for a new Flickr Commons set — and this one will not disappoint. Those fabulous Giffords, with their fabulous picture taking skills, have left us with such an amazing legacy of stunning photography. Pulling together a set of pictures for this “Travels with the Giffords” set was a cinch. So many stunners to choose from! 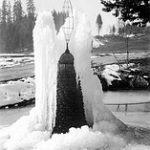 My favorites include the “Ice Garden,” above, which shows a frozen fountain and pond at Gifford home in Salmon River, Washington. Another spectacular shot, “Hot springs near Lakeview” is seen below. Want some more details from the finding aid? The Gifford Family is considered Oregon’s first family of photography. 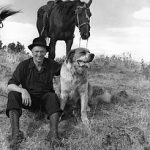 Beginning in 1888, when Benjamin A. Gifford emigrated to Portland from Kansas, they began a photographic tradition that lasted into the 1950s and spanned three generations. Benjamin A. Gifford worked as hotographer in Portland and The Dalles, Oregon, from the late 1880s until about 1920, when his son Ralph took over his studio in Portland. In 1936, Ralph became the first photographer of the newly established Travel and Information Department of the Oregon State Highway Department, a position he held until his death in 1947. 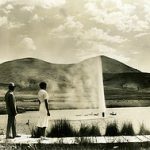 After her husband’s death, Wanda Muir Gifford took over the family’s photography business and continued to take and sell photographs through the mid-1950s. Ben L. Gifford, the son of Ralph I. and Wanda Gifford, joined his mother in the family’s business in early 1950s and also worked for a Salem photography studio from 1951 until 1955. Three generations of Gifford photography began to come to a close when Ben took an engineering job with the State Highway Commission in 1955. This entry was posted in Flickr Commons, Gifford Collection, Main Page on April 18, 2012 by edmunsot.